As it appears, my last post about SFINAE wasn’t that bad! I got a valuable comments and suggestions from many people. This post gathers that feedback. 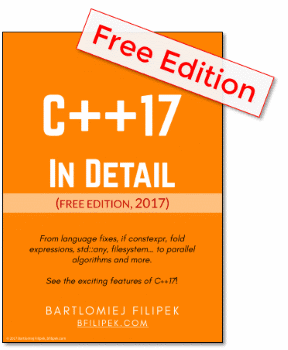 In one comment, STL (Stephan T. Lavavej) mentioned that the solution I presented in the article was from old Cpp style. What is this new and modern style then? It returns the type of C::ToString member method (if such method exists in the context of that class). constexpr suggests the compiler to evaluate expressions at compile time (if possible). Without that our checker methods might be only evaluated at run time. So the new style suggest adding constexpr for most of methods. Starting at around 29 minute, and especially around 39 minute. Walter E. Brown proposes a whole utility class that can be used for checking interfaces and other properties of a given class. Of course, most of it is based on void_t technique. Last time I’ve given an open question how to check for the return type of the ToString() method. My original code could detect if there is a method of given name, but it wasn’t checking for the return type. In the test method we check if the return type of to_string() is the same as the desired one: std::string(). This class contains two levels of testing: one with SFINAE - a test if there is to_string in a given class (if not we fall-back to test(...)). Then, we check if the return type is what we want. At the end we’ll get has_string<T>::value equals to false when we pass a wrong class or a class with wrong return type for to_string. A very nice example! Please notice that constexpr are placed before the ::value and test() methods, so we’re using a definitely more modern approach here. The core thing is std::is_convertible<T*,U*> (see std::is_convertible reference). It’s wrapped into enable_if. Basically, when the two pointers can be converted then we’ll get a valid function overload. Otherwise compiler will complain. It uses explicit detection idiom based on void_t. Basically, when there is no T::toString() in the class, SFINAE happens and we end up with the general, default template (and thus with false_type). But when there is such method in the class, the specialized version of the template is chosen. This could be the end if we don’t care about the return type of the method. But in this version we check this by inheriting from std::is_same. The code checks if the return type of the method is std::string. Then we can end up with true_type or false_type. Once again thanks for your feedback. After the publication I got convinced that SFINAE/templates are even more confusing and I know nothing about them :) Still it’s worth trying to understand the mechanisms behind.